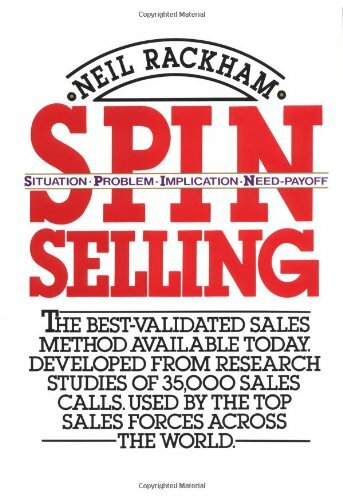 Amazon.com description: Product Description: Written by Neil Rackham, former president and founder of Huthwaite corporation, SPIN Selling is essential reading for anyone involved in selling or managing a sales force. Unquestionably the best-documented account of sales success ever collected and the result of the Huthwaite corporation's massive 12-year, $1-million dollar research into effective sales performance, this groundbreaking resource details the revolutionary SPIN (Situation, Problem, Implication, Need-payoff) strategy. In SPIN Selling, Rackham, who has advised leading companies such as IBM and Honeywell delivers the first book to specifically examine selling high-value product and services. By following the simple, practical, and easy-to-apply techniques of SPIN, readers will be able to dramatically increase their sales volume from major accounts. Rackham answers key questions such as âWhat makes success in major salesâ and âWhy do techniques like closing work in small sales but fail in larger ones?â You will learn why traditional sales methods which were developed for small consumer sales, just won't work for large sales and why conventional selling methods are doomed to fail in major sales. Packed with real-world examples, illuminating graphics, and informative case studies - and backed by hard research data - SPIN Selling is the million-dollar key to understanding and producing record-breaking high-end sales performance. Sales Behavior and Sales Success. Obtaining Commitment: Closing the Sale. Customer Needs in the Major Sale. The SPIN Strategy. Giving Benefits in Major Sales. Preventing Objections. Preliminaries: Opening the Call. Turning Theory into Practice. from McGraw-Hill (July 1, 1988); titled "Spin Selling"
With Bob Kalomeer | Abridged edition from Highbridge Co (May 26, 2000); titled "Spin Selling"
With Bob Kalomeer (other contributor) | Abridged edition from Highbridge Co (August 1, 1998); titled "Spin Selling"
About: Argues that large-scale sales requires different strategies than small-scale sales, and tells how to explain benefits, prevent objections, identify customer needs, and make effective closings.